Sometimes in life a glass of chilled White Wine and a savoury snack are the perfect treat and this crafty Emergency Kit ensures the lucky recipient has instant luxury on hand just when they need it most. All they needs to do is Break the Seal to enjoy a little bit of 'me time' (gifted by you). 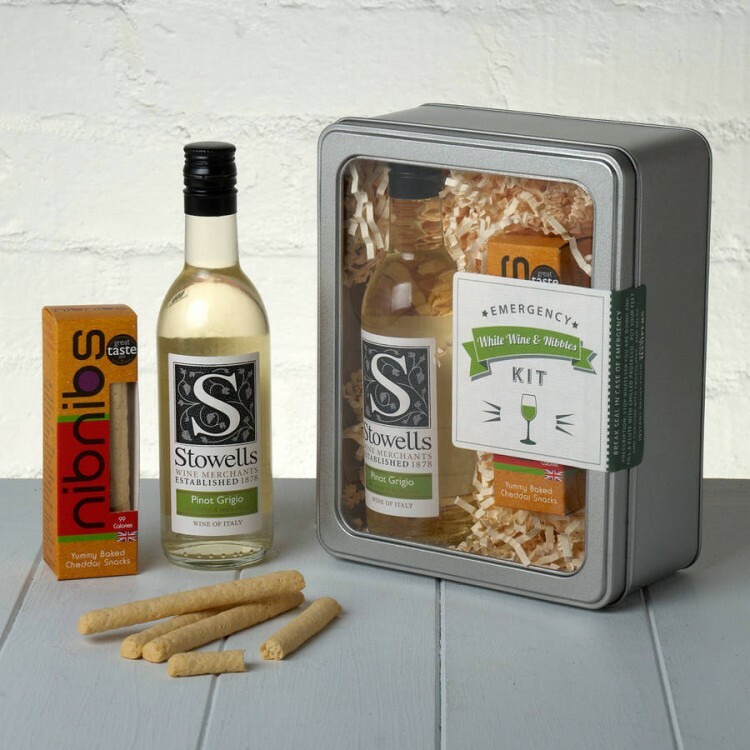 Our White Wine & Nibbles Emergency Kit makes an ideal gift for lots of different occasions - from a family member or friend's Birthday to a great way of saying Well Done, Thanks, Congratulations or even just 'Thinking of You…'. They also make terrific gifts for Hen & Stag Dos or Party Favours. We've paired together a dry, crisp and refreshing White Wine and Nib Nibs delicious Sour Cream & Chive Mini Bread-sticks for this Emergency Pamper Kit! Presented in a stylish window tin lined with coloured shred and finished with a 'Break Seal in Case of Emergency' label, it's a 'ready-to-give' gift. You can even add your own personal message and specify delivery direct to the lucky Recipient.